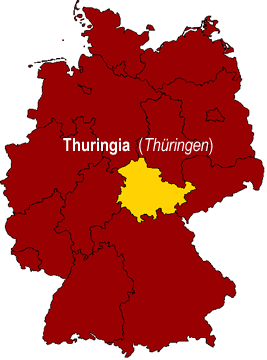 The state of Thuringia (Thüringen) lies in the eastern-central part of Germany. 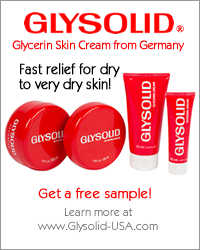 It is bordered by the German states of North Rhine-Westphalia (Nordrhein-Westfalen), Lower Saxony (Niedersachsen), Hessen , and Bavaria (Bayern), Saxony (Sachsen), and Saxony-Anhalt (Sachsen-Anhalt). Established in 1990 after the German Reunification, it is one of Germany's newest states. Thurungia is known as the "green heart of Germany" because much of it, especially in the south, is covered by forest (Thüringer Wald). This, along with its mountain range (Thüringer Schiefergebirge) found in the east, makes Thuringia a popular recreation area. It offers hundreds of miles of walking and hiking paths, as well as great winter sports facilities. The industries found most in Thuringia include the glass, ceramic, toy, lumber, textile, and metal industries, as well as machine and automobile production. The largest companies in the region include Opel (automobile manufacturer), Bosch (supplier of auto and machine parts), and Karl Zeiss (optics). Cooking in the German state of Thuringia (Thüringen) is molded by its wide range of fruit and vegetable production, as well as its large forest. Meals in Thuringia are very hearty, consisting often of large portions of meat with rich sauces. Wurst and wild game are among the region's specialties. Many of Thuringia's classic vegetable dishes stem from its large vegetable production. In fields surrounding Erfurt, cauliflower, turnips, broccoli, and cabbage flourish. In other regions of the state, cucumbers, beans, onions, asparagus, and mushrooms grow well. Cakes also play an important roll in Thuringia's culinary traditions. They are found at every breakfast table, they are central to every coffee break, and they are even offered to party guest as a midnight snack. However, unlike other regions in Germany, Thuringia mainly offers sheet cakes (Blechkuchen). 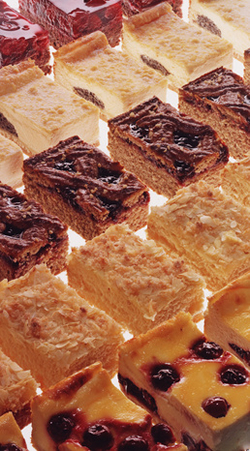 Sheet cakes come in two forms: "Dry" sheet cakes (trockene Blechkuchen), which includes the classic German crumb cake (Streuselkuchen), and "Wet" (nasse Blechkuchen), in which Quark is added to give the cake a cheescake-like texture. Hessen is "potato land," evidenced by the large number of potato dishes. Other important vegetables include cabbage, onions, beans, and asparagus. Popular foods and dishes in Thuringia are listed below. The five largest cities (in terms of population) of the state of Thuringia are listed below. Erfurt is the capital city of Thuringia (Thüringen), as well as its largest city. Its population as of June 2006 was 202,000. Its origins date back to the year 742, shortly after which it became the ecomomic center for the region. The Erfurt University was founded in 1392, making it Germany's third oldest university. Martin Luther was the university's most famous student. Gera is Thuringia's second largest city. It's population, as of June 2006 was 104,000. The origins of Gera date back to the year 995. Gera is well-known for one of its 19th century inhabitants, painter and artist Otto Dix. With a population of 102,000 (as of June 2006), Jena is Thuringia's third largest city. Jena is a university town. Weimar is Thuringia's fourth largest city, with a population of 64,000 (as of June 2006). Weimar is most well-known for its cultural heritage. It was the first republic to be established on German soil (The Weimar Republic, 1919). It was also home for the Weimar Classics (19th Century): Johann Wolfgang von Goethe (poet, scientist, philosopher), Johann Christoph Friedrich Schiller (poet, playwright, philospher, historian), Christoph Martin Wieland (poet, translator, author) and Johann Gottfried von Herder (poet, translator, theologian, history/cultural philosopher). With a population of 47,000 (as of June 2006), Gotha is Thuringia's fifth largest city.